“ Blessed is the servant who loves his brother as much when he is sick and useless as when he is well and can be of service to him. Have a wonderful Wednesday, Everyone! Thanks so much, once again, for taking a minute to stop in to see us today. This entry was posted on July 23, 2014 at 11:30 am and is filed under Faith, Friendship, Gratitude, Inspiration, Kindness, Life, Musing, Philosophy, Relationships, Thought For Today, Wisdom with tags Reflection. You can follow any responses to this entry through the RSS 2.0 feed. You can leave a response, or trackback from your own site. 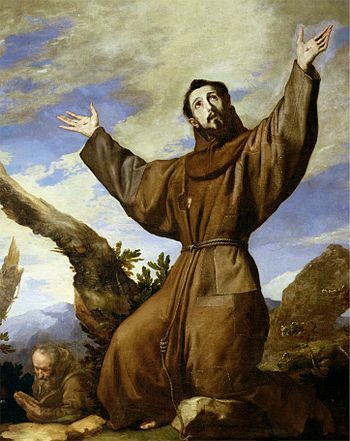 I love the image of Francis of Assisi who held so still birds landed on his arms! I recently read a devotion (Mark Nepo) about people being lonely because they wall themselves off, not letting anything full of live come near…and how we should be more like Francis. Thank you for sharing more of his wisdom – great thoughts! Thank you. 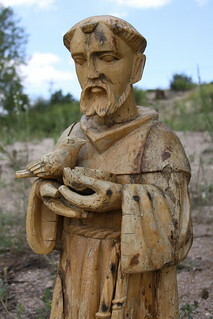 I, too, love St Francis. I fancy myself an animal lover, much as he was said to be. I wish I could stand ever so still and have the beautiful birds and beasts alight upon my hands without any fear or concern for their safety and well-being. I love that Francis was a bit of an oddball in his time. Instead of joining the aristocracy and making much of his wealthy family line, he chose to take the harder, lesser desired road in life. He was willing to give up worldly assets to live among the outcasts and lepers. He chose poverty, chastity, and humility. He wanted to serve those who had nothing. He was quite a guy. And, even if I am no longer a “good” Catholic, I have much admiration for the new leader of the Church, who endeavors to be the namesake and disciple of Francis’ works. The new Holy Father is reaching out to common peoples everywhere…to serve them. I believe he is genuine and sincere in his quest to touch the lives of many who live in despair and darkness. He strikes me as a gentle, humble soul. Time shall tell. Yes, we should all aspire to their qualities. You make a great observation of both men, yes – time will tell! Words we should all live by. It should include our Mousie friends too. 😛 I’ll see if I can FedEx him, post-haste! HAH!